The Hertsmere Community Spaces, new community youth shelter opens to the public at Furzefield. The shelter provides a place to hang out with friends. 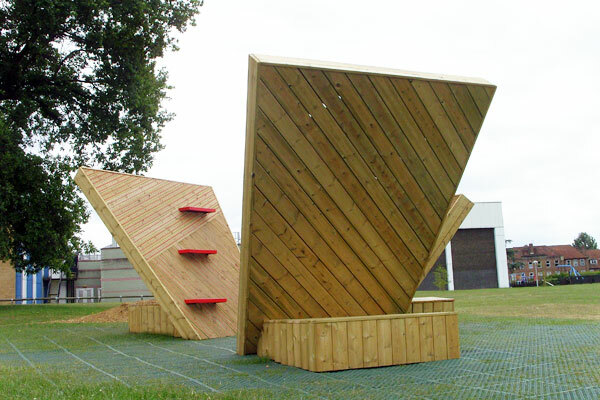 The unique shared structure allows people to climb up high and have views across the whole park. With seating steps you can have a rest on the way up or way down to stop and enjoy the view. If it gets... rainy then shelter under the slopes of the shareds, or just find a different space and view. The shelter provides a new space for all park visitors all year round. 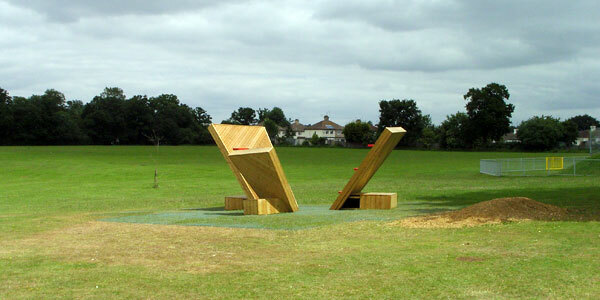 Furzefield Park is a unique site which sits is at the back of the Furzefield Leisure Centre. It consists of King George V playing field, Furzefield woods, an ancient woodlands and a meadow area, which Potters Bar Brook runs through.Furzefield Wood and Meadow was designated a Local Nature Reserve (LNR) by Hertsmere Borough Council in September 1998. The playing fields unique features are three mature oak trees. These run in a line and are the remains of an old hedgerow. 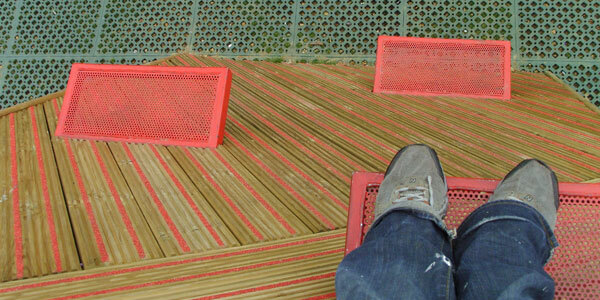 The shelter is made from an anti-slip red striped resin plastic inserted boarding with metal mesh seats. The underside seats are made from soft wood cladding. There is a steel sub-structure. A play rubber surface has be used for the surrounding area and can be planted to sympathetically place it in the old hedgerow and will eventually be overgrown by grass. The shelter has passed all play inspections and is happily being used by all ages of the community. The fantastic fabrication was carried out by Mark Cosgrove Associates at The Scenery Shop. The Hertsmere Community spaces shelters have been installed at The Moatfield in Bushey, Furzefield in Potters Bar and Phillimore Recreation Ground in Radlett. Superblue worked on this project with Green Heart Partnership and the team of officers from the Parks and Amenities, Communications, and Community Services teams at Hertsmere Borough Council, Aldenham Parish Council, the Police and other stakeholders. 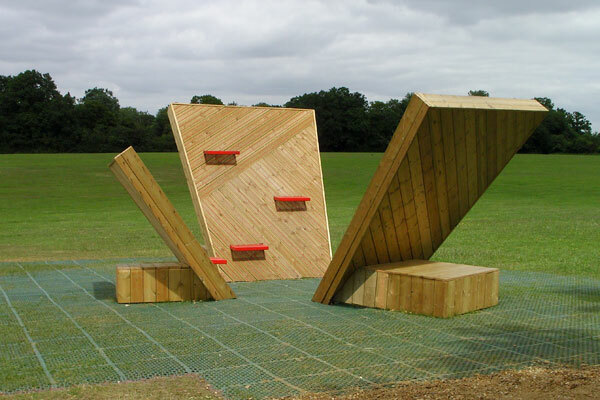 The design of these community spaces follows community consultation carried out with young people in summer 2007, which led to a successful application to the Big Lottery Play Fund.